Copy one page, or an entire site to your computer! Grab-a-Site 5.0 is a file-based OFFLINE BROWSER that combines speed, stability, and powerful filtering capabilities. If you need an "industrial-strength" tool that can download an entire web site while retaining the original filenames and directory structure , Grab-a-Site is for you! CONTROLLED downloading to the detail! Downloading web pages and all their supporting files (such as graphic files, sound files, etc.) by hand can be inconvenient, time consuming and frustrating. 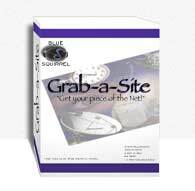 Blue Squirrel's Grab-a-Site addresses these problems by allowing you to download a quantity of information or an entire web site to your hard drive. Downloading can be done in off peak hours when access lines are available and less expensive. The data may then be edited, browsed, studied, or used in any way offline at your convenience. This makes the use and modification of the information gathered more economical and efficient. It is simple to use and cost effective for anyone working with web content. NEW! File Grabbing Grab every movie (MOV, AVI), picture (JPG), document (PDF), Program (EXE), or Archive (ZIP) file from a site. You decide which files to keep as the site is grabbed. NEW! Search and Replace Set up your project, and every time you grab the site, you can do the same Search and Replace. Great for tweaking a live web site for CD distribution, or making minor adustments for other browsers. NEW! Multi-threaded Get web sites faster. Grabs from multiple web sites at the same time. NEW! Export Export the web site to burn it to a CD with Nero, Easy CD Creator, etc. NEW! CD Autorun Generates files so that your CDs of web sites will automatically run when inserted into the CD drive. NEW! Better Help Easier to use, and help buttons where you need them. Download Limits Limit grabbing by levels, size, or time. Instant Update Stay current with the latest changes. Automatic updates. Easy to turn on and off. Tree View View the site in a easy to navigate view similar to the Windows File Explorer. Dynamic to Static Grab sites written in PHP, ASP, JS, or Cold Fusion, and turn them into static HTML for distribution on plain old web servers or on CD. Directory Preservation Preserve the web directory structure when grabbing files. Rebuilds the domain and directory structure on your disk. Great for mirroring sites to other servers. File-based HTML and other files are stored just like on a web server except you won't need a web server to view the files. Filtering Include or Exclude sites or areas of a site to get just exactly what you need. Filters are stored in a project so you can repeat the same grab over and over. FTP Follows FTP links to download files. Password Support Grab sites that are password protected with standard HTTP password authentication. Relative Link Adjustments Move web sites to a CD-R, floppy, or hard drive and the links will still work.